Species: Lomatium dissectum v. dissectum. 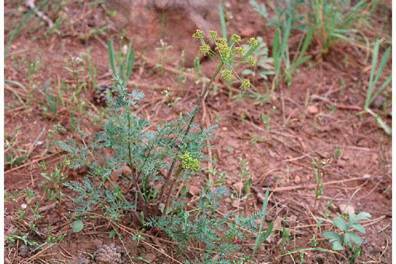 Fern-leaved desert parsley. Traditional uses: Medicine, also comprises a major portion of the root vegetables used by the interior plateau peoples of British Columbia, Washington Idaho and Montana. Elevation: From low to mid elevations. Local occurrence: L. dissectum is found from British Columbia and Alberta south to California, Colorado and Arizona. Low to mid elevations. Habitat preferences: Grows on open, dry, rocky slopes. Drought tolerant. Normal rate of growth or spread lifespan: Perennial, blooms early summer, fruits spring-fall, rapid growth period spring-summer. Short life span. Slow vegetative spread. Hunn, Eugene. Ethnobiology class notes.